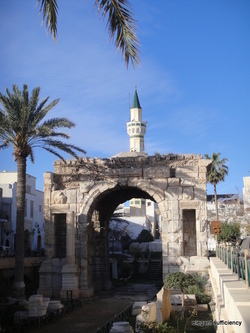 Our last morning brought us full circle, beginning our walk through the Medina with Abdullah in more or less the same place as we'd finished our first exploratory mooch when we arrived on Friday afternoon, the Arch of Marcus Aurelius. We walked around, better able to put it in perspective now we'd seen more of the city and been to Leptis Magna. The blue skies and warm, comfortable temperatures brought the city to life. 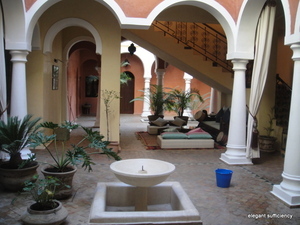 Abdullah took us inside the Zumit Hotel, one of a new breed of restored places to stay in the traditional style. The Zumit hotel had been a caravanserai and retained all the atmosphere of those days. As we stood in the courtyard dining room, gazing up to the blue sky, a small tortoise wandered along at our feet, quite at home here in the sunken part of the building. Next stop, the Gurgi Mosque, small but beautifully decorated and very atmospheric. 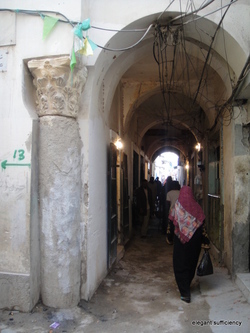 Wandering through the old streets of the Medina, we heard of plans to renovate these fine Italian style houses, formerly homes of wealthy merchants and their families. Frequently on the corner of a small street or Zenghat, there would be a Roman pillar, "reclaimed" from Leptis Magna and put to use in a slightly different way from that which was originally intended. Life goes on in 21st century style in streets not really made for vehicles and we step inside another restored building to take a look. This one is the El Khan Hotel, stylishly decorated in a very sympathetic way and certainly somewhere to consider for our next visit - yes, there will be another trip here before long! 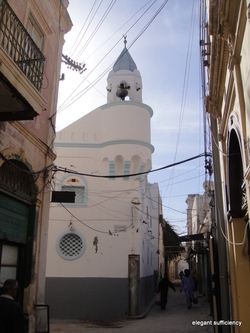 Across the street, then, past another pillar on the corner, and into the House of Yusuf Karamanli, now a small museum of life here in Tripoli. 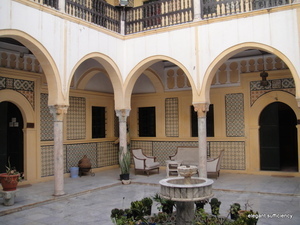 Another beautiful courtyard, more tiles and patterned surfaces. The darkened rooms contained a collection of bits and pieces, including some terrific pieces of embroidered clothing with some great trapunto style work on silk jackets - we'd seen an elderly gentleman wearing such a jacket earlier and it was good to learn a little more about it. Another corner, another pillar and down another zenghat and we got a quick look inside a weavers workshop, then a quick mooch around the silk purchasing cooperative next door. 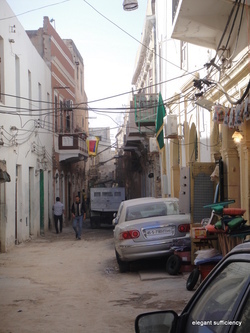 Both places open and empty, their occupants having gone off for a break but no matter, no need to lock up or anything - Tripoli is just that kind of place. 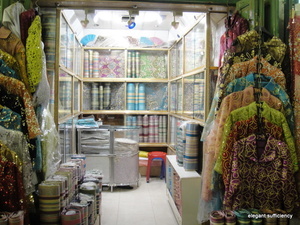 Now Abdullah knew that textiles were "my thing", he turned sharp left and there we were, in the silk alley where shop after shop was filled with glorious colour and sumptuous fabrics. 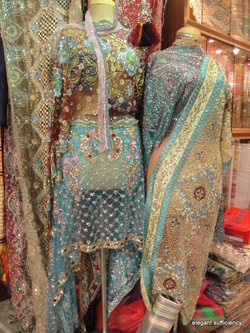 Heavy beaded pieces hung by the doorway and we were assured that women did indeed wear such things if only on special occasions! 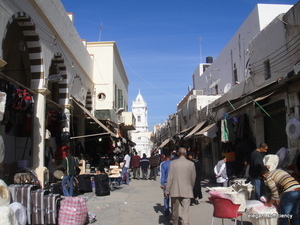 Out into the open again and finding ourselves on the main route back into Green Square, we regained our bearings - we were near the Copper Souq we'd explored on Friday, when all was closed. Time to step inside the Jamahiriya Museum now and an opportunity to see the treasures of the city, most particularly some fine mosaics we'd heard were essential viewing.